A government press release denounced the “interventionist commission” and said the delegation was “not welcome” in Nicaragua. August 15 (teleSUR) The presence of a Labor Commission from the Organization of American States (OAS) in Nicaragua is “unacceptable,” President Daniel Ortega’s administration said in a statement Wednesday. 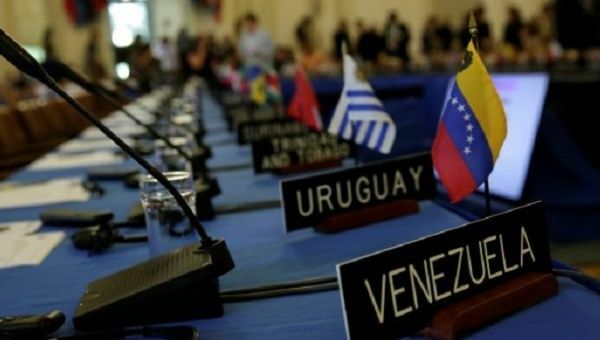 A press release from the capital denounced the “interventionist commission” which was created four months ago by the OAS Permanent Council and promoted by the United States, Argentina, Brazil, Canada, Chile, Colombia, Mexico, and Peru. “The government of reconciliation declares that the members of that commission that conforms and directs the United States in the desire to continue intervening in the internal affairs of Nicaragua from the OAS are not welcome to our country, therefore they will not be received in our homeland,” said Foreign Minister Denis Moncada. The letter added that these statements are issued in accordance with Nicaragua’s sovereign security policies, codes of national dignity, and respect for state decisions. According to OAS Secretary General Luis Almagro, the special commission was sent in to analyze the country’s internal crisis and not to interfere. However, the Labor Commission has stated it plans to defend democracy, justice and human rights within Nicaragua. In an official statement published late last month, the government of President Daniel Ortega said the commission was neither needed nor wanted and was in fact “energetically rejected” as a political maneuver which does not have Nicaraguan consent. Nicaragua has experienced a wave of violence that has killed more than 100 people and damaged parts of the country’s economy. The crisis began in mid-April when protesters took to the streets against a proposed social security reform that sought to overcome the system’s financial crisis by increasing contributions by both employees and employers to avoid raising the retirement age. The violence has eased after the implementation of various security measures were introduced last week and the country is looking for new avenues to ensure greater national stability for the future.